The tourism and hospitality sector is one of the most important sectors in Dubai and UAE. This sector is playing major role in economic prosperity of Dubai and helped the emirate to compensate its low oil reserves. Large skyscrapers and artificial wonders play important role in attracting tourists from all over the globe. The arrival of large number of international tourists resulted in construction of beautiful and modern hotels and restaurants. Due to free market, these hotels take all measures to attract visitors. One such important step is taken in account in last month. 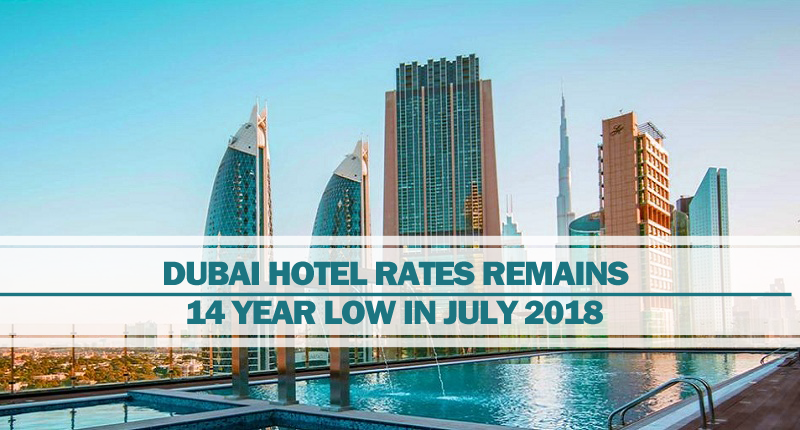 According to a recent report by STR, American company that tracks global hotel industry, ADR (average daily rates) of hotels in Dubai decreased to their lowest levels in last 14 years. It happened despite the fact that demand and supply growth of hotels in Dubai remained consistent and it was seen in stronger level. According to the data collected in month of July 2018, the hospitality market of Dubai experienced rise of 6.3% in supply and 7.2% in demand. Along with that, the occupancy rate in these Dubai-based hotels in July rose by 0.9% that resulted in achieving tenancy rate of 66%. This is a very positive indicator because July is the warmest month of year during which temperatures get above 40 Celsius. Usually, occupancy rate falls in July and in other summer months. But this recent report clearly indicates the success of new tourism policy adopted by government of Dubai that is directed towards converting tourism sector towards a year-round activity. In fact, an important reason behind this growth of tourists is decrease in charges of hotels. According to the same report by STR, ADR (average daily rates) decreased by 10% and they reached to AED 423.63. As a consequence, revenue per room also fell by 8.8% and average rate remain AED 279.81. The only negative factor seen here is slight decrease in performance level. It was the result of pressure that originated due to sharp increase in supply. These statistics clearly shows that tourism and hospitality sector is clearly on rise as Dubai is successfully moving towards making UAE as a year-long tourist destination. It is creating good opportunities for all the businesses related to tourism and hospitality sector. For furhter details and assistance, you can contact Riz & Mona Consultancy. We provide trade license in Dubai for all business sectors and visa services for tourists.